Winter is our favorite time of year for baking. It warms the kitchen and fills the house with yummy aromas. Almost every recipe you have can benefit by using buttermilk in place of milk. Buttermilk is a must when baking cakes, cookies and quick breads. It helps everything you bake remain moist including corn bread. It can be used in your waffles and pancakes and who doesn’t love a buttermilk biscuit. We have amazing buttermilks available where you find our dairy. Our cultured buttermilk is made with our no fat milk and the same cultures we use when making our butter. It is light, refreshing and pure delicious. Here is a recipe for some wonderful cookies we have been sharing with our production crew at the Creamery. In a large bowl, melt the butter (20-30 seconds or so in microwave on low power) and then whisk in cocoa powder until smooth. Whisk in sugar, vanilla and buttermilk, then stir in the flour mixture until combined. Stir in the butterscotch chips. Place bowl in fridge to chill for about 30 minutes (or leave covered in fridge for up to 2 days). Scoop dough in 1” balls onto prepared baking sheet and bake for 10-12 minutes, util cookies are set around the edges. Allow to cool on baking sheet for a few minutes, then transfer to a cooling rack to finish cooling. There are also many health benefits to buttermilk besides baking with it. Check out this article to read about all the greatness of Buttermilk. Here is a link to 25 Amazing Benefits and Uses of Buttermilk. 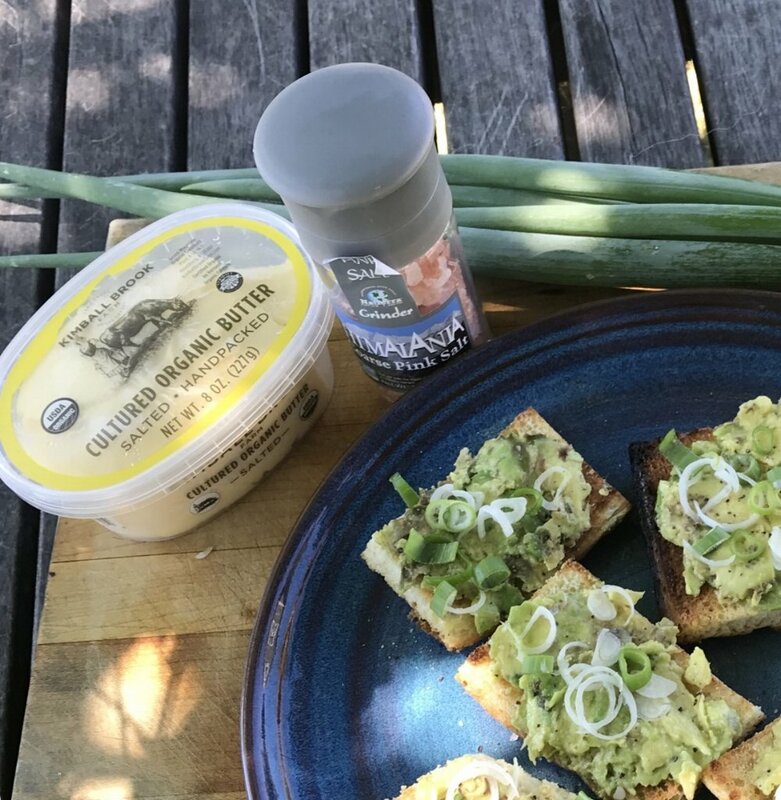 Be sure to pick up some Kimball Brook Farm Cultured Buttermilk for all your baking needs and to enjoy for improving your health. It’s that time of year and it wouldn’t be the holidays without eggnog. We think the best eggnog around is the kind you make yourself at home. You have complete control as to what goes into it and it’s not hard to make. You can use whole milk and heavy cream for an amazingly thick and creamy nog, or use lower fat milks, you still get a rich flavor with less calories. This recipe takes about an hour to cook and requires minimum of 8 hours to cool, so plan ahead and enjoy with family and friends. 1. Bring milk and nutmeg to a simmer in medium saucepan over medium heat, stirring occasionally. 2. In large bowl, whisk egg yolks and sugar until smooth. Whisking constantly, slowly pour hot milk into eggs. 3. Return mixture to pan; cook over medium-low heat, stirring often, until thick enough to coat back of spoon, 20 to 25 minutes; do not let simmer. 4. Remove from heat and pour through a fine-meshed sieve into a bowl. 5. Whisk in heavy cream and bourbon (optional). Cover with plastic wrap and refrigerate until chilled, for at least 8 hours or overnight. 6. Ladle into cups and garnish with nutmeg, if desired. It’s a wonderful addition to any holiday gather and even better to enjoy all winter long. We absolutely love our new cultured buttermilk! So we had to find a great recipe to use it in. This King Arthur Flour Farmhouse Buttermilk Cake is a favorite with the creamery staff here at Kimball Brook Farm! A delicious and easy to bake cake that makes for an amazing morning treat or a show stopping dessert. This cake only takes about an hour to an hour and a half to prepare and bake and you won’t be disappointed with the results. Using our organic buttermilk gives this cake an amazing flavor and delicious moist interior. For a completely organic cake use King Arthur Flour’s organic all purpose flour, organic eggs, and definitely use Kimball Brook Farm buttermilk! An easy and versatile recipe that is sure to be enjoyed by all! Preheat the oven to 350°F. Lightly grease a 9" x 13" cake pan. Beat the butter and brown sugar together till smooth. Add the eggs, beating till smooth. Stir in the buttermilk and vanilla extract. Add the baking soda, salt, and flour to the wet ingredients, beating till thoroughly combined. Bake the cake for 35 minutes. Towards the end of the baking time, prepare the topping. Stir the butter and the sugar together. Add the milk, pecans, and salt. The glaze will be thick but pourable. Top the baked cake with the topping, and return to the oven for another 10 minutes. Remove the cake from the oven. The topping will look very runny. You can eat the cake hot, with the glaze still gooey; or let the cake sit at room temperature for a few hours, by which time the glaze will have set. Homemade Whipped Cream the Kimball Brook Farm Way! Whipped cream truly does not have a season. We always think of it during the holidays, can't imagine pie without it. Then there is the wonderful berry season that lasts all summer, strawberries and cream, truly what summer is all about. What about apple picking season? All those apples pies and crisps coming out of the oven during chilly fall days definitely need whipped cream. Pumpkin pie and chocolate yule logs, it’s not the holidays without whipped cream. And you can have hot chocolate in the winter without whipped cream, but why would you? There are a number of ready made whipped creams to be found in the markets, yet be sure to read the ingredients, there is a lot of added "stuff", not just sugar, in those cans and tubs. Here are Kimball Brook we make our own whipped cream from our divine heavy cream. Many folks still make their own at home, but many have opted for the store bought. It is so easy to make your own at home and once you do, you won't go back. The best part is you completely control what you add to the whipped cream and everyone will be glad that you do. Kimball Brook Farm Heavy Cream - If you can't find KBF cream, try to buy organic and not ultra pasteurized, it doesn't whip up as well. Do not buy whipping cream, it contains extra and unwanted ingredients, you only need heavy cream. Make sure the cream and the bowl are very cold. Whip cream with mixer or whisk for 6 to 8 minutes, it will take longer with whisk. Just keep at it until soft peaks start to form. Continue until you get the consistency you want. You do not need to add sugar to get the cream to whip. If you would like to flavor the whipped cream, by all means do and add the flavoring to the cream before whipping. If you are using a machine for the first time, maybe use only half the cream or have more on hand, if you are serving a dessert that must have whipped cream. Folks may not like sweet cream butter on their berries, altho it would be delish on hot apple pie. Definitely be creative with what you like to flavor your whipped cream with. I have heard a number of great ideas of different flavors folks add. I have to say that I like my whipped cream completely plain. Our sweet heavy cream is sweet enough for me and you get a true cream flavor to go with any wonderful creation you put it on. Enjoy and let us know what you are serving your whipped cream with. Cheers! Whipped cream on summer berries. I love butter! Who doesn't? Certainly butter is one of those foods that is best consumed in moderation, so why not eat the best butter available? There is plenty of research out there about the importance of including good fats in our diets, and butter is a good fat! Yet not all butter is created equal. I have provided a couple of links at the end of this post which discuss all the good things found in butter as well as some not so great butters to avoid. Here at Kimball Brook Farm, we love butter too. When I first started working for KBF, I used to make a lot of butter from our amazing heavy cream. About 3 years ago, we started making cultured butter at the creamery. I had not had cultured butter before and after one taste of ours, I was hooked. What is cultured butter? No it’s not butter we took to Paris, yet it’s as good as the European butters in flavor and better yet, it’s local! We add a microbial (live) culture to the heavy cream and let it “culture” for at least 6 hours before churning. That is the science behind it, but what it means to our palette is a real depth of flavor, the first taste on your tongue is good and then it gets better. Yum! 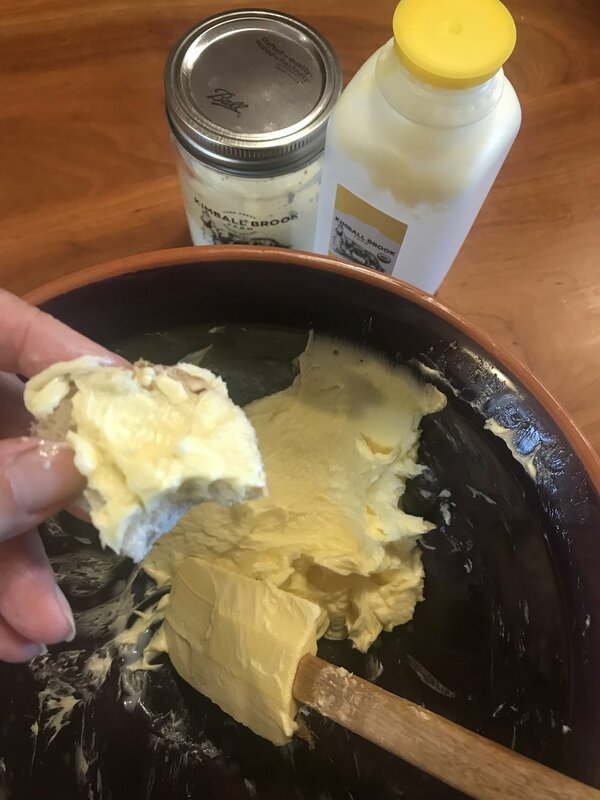 With it being so easy to just grab a tub of KBF's butter at the store I stopped making my own sweet cream kind for a really long time, but this summer I found myself missing the joy of making my own and so decided to get back to it! Today, I am going to share with you how to make your own butter and compound butter. It's simple and delicious! Half fill the ball jar with the heavy cream (you need to leave space for the separation). Secure the lid and start shaking. Shake, shake, shake! Soon a ball will start to form. Keep shaking until the ball is compact and the liquid is thin. This liquid is buttermilk, so be sure to save for adding to pancake or biscuit recipes. Add in some cold, clean water and shake a little more, giving the butter a clean water wash. Pour off the water and put the butter in a bowl. With a rubber spatula, press all the excess liquid out of the butter. Make sure to get all the liquid out, as any left will make the butter go rancid. If using a food processor pour in the cream, secure the lid and turn the button to the highest setting. After about 3 to 5 minutes, you will see solids starting to form. Keep going until you have a big ball of butter! The thin liquid that forms is buttermilk. Be sure to save this for another recipe. After pouring off the buttermilk, add fresh water, power again and then pour out all the liquid. Transfer it to a bowl and, with a rubber spatula, press all the extra liquid out of the butter. Make sure to get all the liquid out, as any left will make the butter go rancid. Now you have butter! Grab a knife and spread on some bread or a cracker. This soft sweet butter is divine. If you're feeling adventurous, why not try making compound butter? What is compound butter? Quite simply it's flavored butter, which can be sweet or savory! Below are two recipes for compound butters which I enjoy making. You can use your own homemade butter or our KBF cultured butter. The first is what I like to call my Simon & Garfunkel butter; with fresh sage, rosemary and thyme (parsley doesn't add much). I also like to add a little roasted garlic (about one clove). Finally chop the herbs (about a teaspoon each, less if you're using dried herbs) and then fold the ingredients into the softened butter. For a sweet butter, I like to add maple syrup (about a quarter cup or to taste). Another favorite is a little sugar and cinnamon. Basically you can add whatever you like! After adding your ingredients, put the butter in a container or roll it into a log with wax paper and refrigerate for at least 2 hours. Then you can slice discs off the roll and put the patties on steak, biscuits, in the pan to cook eggs or veggies, or right on to an ear of corn. Butter also freezes very well and can be stored in an airtight container for up to 6 months. Be creative, add what you like and enjoy! Here are a couple of links to more compound butter recipes. Here are a couple of interesting articles, one about good butter versus not so good butter and one about all the things in butter that are good for us. Butter is great in any and every season and is always a wonderful addition to most anything coming from the kitchen or grill. Healthy eating, good nutrition, tasty and satisfying foods: this is a constant conversation and for some, a struggle to accomplish. There seems to be a health crisis surrounding us in this modern age, it is in the news on a daily basis. Obesity, high blood pressure, diabetes and so many more health issues that plague mankind, what is the cause of so much illness. Many believe this crisis can be attributed to our environment and many also add our current food system to the blame list. Where do you get information and advice on the best food companies to shop for to feed your family. With all the buzzwords and marketing tactics that the food industry uses, see our blog from January, how does one really know what is truly healthy and will support good nutrition. "The Cornucopia Institute, through research and investigations on agricultural and food issues, provides needed information to family farmers, consumers and other stakeholders in the good food movement and to the media. We support economic justice for the family-scale farming community - partnered with consumers - backing ecologically produced local, organic and authentic food." The articles on their first page at this time are about the Farm Bill in Congress, which just got voted down, read their article to find out why this is a good thing. Also they reveal more reasons why roundup is so bad and also discuss why grass fed beef is better for the environment. 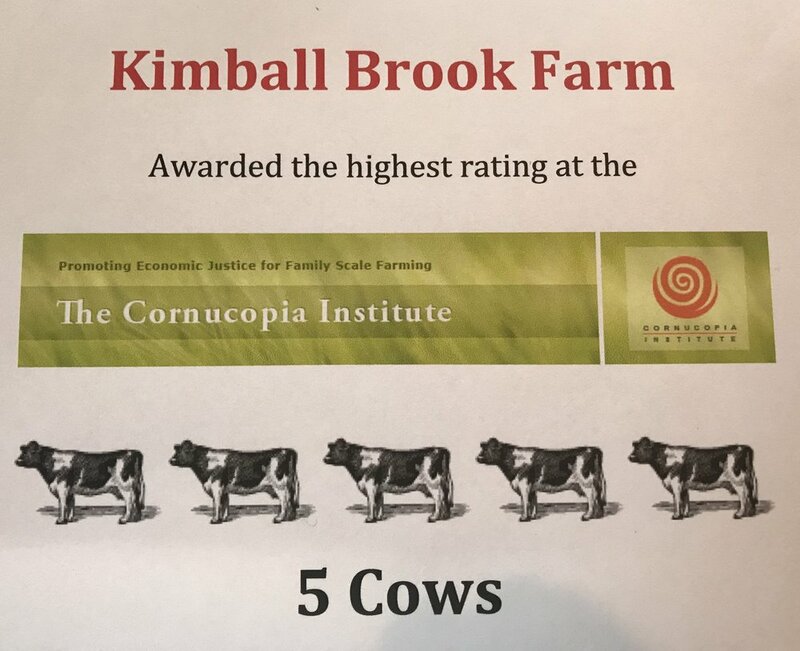 Another really great thing about The Cornucopia Institute is they review and give scorecards to many different foods that are available in our stores. Consumers can learn which products are safer and why, and learn more about the farming practices of the foods they buy. Every product is given a score. There are many other articles of interest dealing with such topics as organic farming versus factory farming to name just one. That is another great conversation to have; we will discuss it in another blog post. Thank you for supporting local, organic single-family farms. Enjoy the bounty of Vermont! All Natural, Organic, Pasture Raised, No Artificial Ingredients, Gluten Free, Local, GMO Free, Raw, Ultra Pasteurized; these are examples of some of the words used to entice us as we shop for the best food possible for ourselves and our families. What does it all really mean? Food producers are in the business to feed people and many are looking to feed us well and make us happy. Yet they also have to keep a healthy bottom line for their companies. So the marketing department is a very important piece to being competitive on the grocery store shelves. Those enticing phrases on the product labels are there to catch our attention and appeal to our desire to feed ourselves the healthiest foods available. The marketing department has hit the dairy section too. Fresh, Local, Organic, More Protein, 100% Grass Grazed; there are many options to choose from. There is an important thing to learn here. Fresh and local are important if you truly want the best milk for your family, yet you should research your local farms to learn more about their farming practices. If you like what you see, then that is a great choice. If you really want the healthiest milk with the most nutrition and flavor, choosing organic is the best option. Organic and local, grass grazed and 100% grass grazed, what does it all mean. If you live in the Northeast and the label says grass grazed or 100% grass grazed, then the cows are out on pasture approximately from May to November. In the winter months, the cows do live outdoors; they grow wonderful shaggy coats and are around the barns with cover to get out of the weather as needed. They eat organic hay grown for them all summer. Some organic dairies will supplement the winter diet with a power pack of organic legumes and grains. Grass and hay are very high in protein, so as needed, a supplement of good fats helps to keep the gals happy and heathy. Many organic brands are also cooperatives with the milk being sourced from many organic farms. The organic brand may be considered a local brand, just know that the farms sending their milk to this brand may be located all over the Northeast. Also, look to see if the milks are ultra pasteurized or just pasteurized. Ultra pasteurization tends to not only cook out more nutrition, but flavor as well. A couple more thoughts; gluten is never found in pure milk. Check the ingredients of the flavored milks to make sure there are no crazy ingredients that contain gluten. Also, butter made from pure heavy cream will not contain gluten, again, read the ingredients labels. One more, certified organic is always GMO free, conventional dairies may feed their cows GMO grains. I have met some customers who shop at large grocery store chains who have very high standards around the food they will stock on their shelves. It can be very easy to trust that everything on the shelves is truly the best product for us. Beware, again those enticing labels and catchwords may lead you to buy something that isn't the healthiest. It may take more time, but doing a bit of research on that new product and the farming practices that go into producing it will make you a more informed shopper. Marketing is very important to the success of all businesses, food or otherwise. It is of the utmost importance to us and our good health to spend a little more time looking deeper into what those labels are selling us.